The central goal of this research focuses on the analysis of the influence of extracurricular activities on university management performance, in order to bring real contribution in terms of increased quality of university management by diversifying the extracurricular activities’ offer within universities, with effect on performance management growth. The research includes a detailed radiography of specialized studies from the field in order to determine the current state of scientific knowledge in conceptual terms and highlights the functionality of the university system. As specific case studies of the functionality of the extracurricular activities’ subsystem, the pilot research of comparative management stands out, research that has been extended, analysing five major Romanian universities. 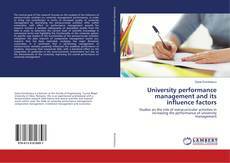 It is confirmed that a performing management of extracurricular activities positively influences the academic performance of students, improving their transversal skills, with a beneficial effect on the integration of graduates in the socio-economic environment but also on the attractiveness of the university, improving the overall performance of university management.